Handmade toffee with Cabot Creamery Butter! Crisp and buttery, each square melts in your mouth! The flavor is irresistible. 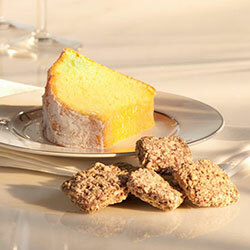 Fresh-made toffee centers, dipped in milk chocolate or dark chocolate, rolled in oven roasted cashews and almonds. 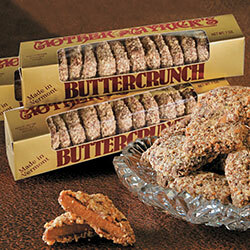 Every piece is made from scratch with award-winning "Best of Class" Vermont Cabot Creamery butter. 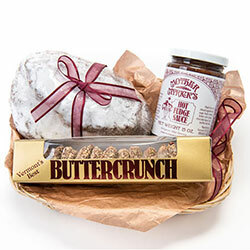 Our most popular confection is offered in one or two pound gift boxes or by the dozen in 4 oz. and 7 oz. Value packs. 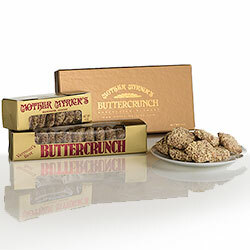 Did you know our buttercrunch is gluten free?